I always wear something special for Valentine's Day. Whether it's pink, red, or covered with hearts, I cannot remember a year that I have not worn a little pretty for this special day. My mom was such a fun mom when I was little and always had something fun for my sister and me to wear...pink or red on Valentine's Day, green on St. Patrick's Day, and red, white, and blue for patriotic holidays. Even before the minnies were born, I knew that I would be a mom who would delight in finding adorable holiday outfits for them to wear! I have to secretly admit that I was thrilled when I found out that I was going to have girls because my thoughts immediately turned to bows, smocked dressed from France and Spain, and all things pink! Natalia and Alexia are wearing white organza smocked dresses in their first passport pictures, taken at one month of age. Over the top, perhaps, but the dress was a gift and I they had to wear it somewhere, right? Valentine's Day is a whirlwind of school parties, exchanging valentines with classmates, and lots of fun. I'm doubting that the girls will have an official party this year, but they're already working on their wardrobe choices for the special day and have chosen their valentines from Tiny Prints. Hearts are always a fabulous choice for Valentine's Day! Add some tulle, make it pink, and it's a winning choice. Little girls will love this Heart shaped tulle skirt from Gap. Pair it with a monogrammed or personalized t-shirt and she'll be comfortable and adorable at her school party. Older and younger will appreciate Kayce Hughes' Margret Blouse in the Red Bow print. The pretty red and white print is whimsical and fun. The shirt is incredibly versatile and looks great with jeans or a skirt. You can wear this throughout the season without it screaming, "This is my Valentine's Day shirt!" Since your little minnie will be doing a lot of other activities on Valentine's Day besides the party, comfort is important. Bright pink paired with polka dotted tights is so pretty! The Samantha Dress from Olive Juice transitions from playground to party and is easy to wear. Olive Juice's clothing is such high quality and can survive almost any elementary school mishap, even a painting accident! Oops! Although my minnies are excited to dress for Valentine's Day, they're well beyond pink tulle skirts and other options that they used to love. Natalia saw the pink tulle skirt when she peeked over my shoulder and said in a sweet, high pitched voice, "OH, Mommy. 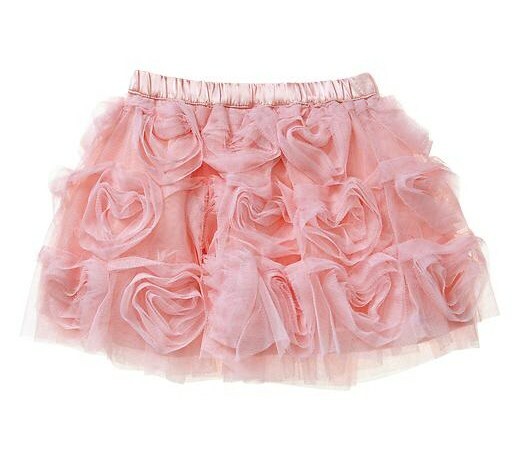 That skirt is soooooo cute for a little girl for Valentine's Day. We TOTALLY would have worn that." Emphasis on would have. So what's a tween Mommy to do? Luckily, there are lots of choices that make mommies and tween minnies happy. This heart dress and tights from Benetton is edgy and fashion forward for the tween set without being babyish or silly. Crewcuts is another great choice for little ones as well as tweens. 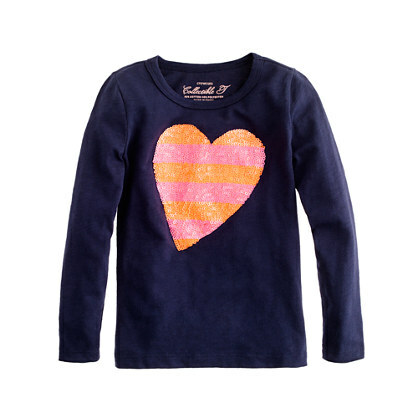 The Long sleeve stripe sequin heart tee from J. Crew is perfect with jeans or a skirt and comes in many colors and styles. Stay tuned for another edition of my top picks for Valentine's Day outfits, including choices for women and for your favorite sweetheart! so cute! I love picking out a Valentines day outfit.